Sun Conure Personality, Food & Care – Pet Birds by Lafeber Co. The sun conure is bold in both appearance and in personality. Suns are known for their vocalizing, which can be loud a times, as well as their playfulness and adventurous nature. Young sun conures are primarily green (resembling more of a jenday); their orange coloring becomes more pronounced as they mature. Sun conures are not sexually dimorphic; however, females are said to have slightly shorter tail feathers as well as rounder, slightly smaller heads. The sun conure is one of the more popular conures of its size due to its stunning plumage, its extraordinary disposition, and its exceptional quality as a companion bird. Sun conures are lively, vocal, and expressive; this is a bird best known for its beauty and its big mouth. The sun conure is approximately 12 inches long, and is most recognizable by its bright orange and yellow coloring, often mottled here and there with splotches of green. The sun conure has a black beak, white rings around its eyes, and a long, tapering tail. The sunny’s striking coloration and sweet temperament makes it a favorite among pet owners and a darling with experienced aviculturists because it is easily bred. Immature birds do not reach their full coloration for about two years. Though the coloration between the sexes is very similar, the males are said to be slightly brighter. Males are also said to have a squarer, flatter head and females a rounder, smaller head, though only experienced breeders are good at eyeing the birds and making an educated guess. Certainly there’s no difference in pet quality. The sun conure is native to South America, specifically Venezuela, Northern Brazil and Guyana. The sun conure is no messier than smaller birds and loves to be outside of the cage for playtime. A sunny will revel in its owner’s attentions and isn’t a bird that enjoys being left alone. It will appreciate another sun conure as a “comrade” and will not lose its pet quality if the owners are attentive to both birds. Because it’s in the Aratinga family, it can be paired with a jenday, mitred, nanday, gold-capped, blue crowned, or another Aratinga, but not for breeding purposes. These birds should be exclusively platonic pals. Some breeders create “Sundays” or “Jensuns” but this is not recommended because hybridization taints the already limited gene pool. A sun conure should be offered a nutritionally balanced manufactured diet, as well as a wide variety of fruits and vegetables. Conures have busy beaks, which makes Lafeber foods a conure favorite. Lafeber’s Avi-Cakes, Pellet-Berries and Nutri-Berries offer balanced nutrition that appeals to a conure’s chewing needs. A sun conure can live between 15 to 25 years with proper nutrition, exercise, and regular veterinary visits. Breeding females or pets laying eggs without a mate are prone to egg binding and calcium deficiency. Sun conures that are confined to a small cage are prone to becoming overweight as well. These birds are playful clowns, lying on their backs or dangling from a rope toy — they are forever amusing. They are also easily trained, but will bite if provoked. 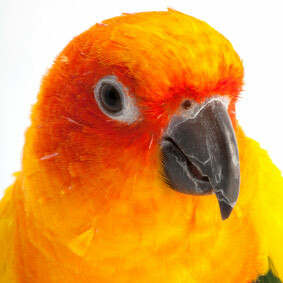 In general, however, the sun conure is extremely affectionate and cuddly and will be deeply loyal to a gentle owner. This is a good family bird and will not “turn” on family members if they are kind and attentive to the bird. Sunnys are not the loudest of conures, but they are a vocal species and will do their share of screaming, without exception. Most conures are notorious for noise; don’t risk getting home and being upset that your pretty new bird won’t shut up. The sun conure may not be any noisier than a canary, but it’s the quality of the voice that matters — the sunny’s cry is shrill and piercing, and is emitted in rapid succession. Periods of noise and periods of quiet are normal for the sun conure, however, a sunny that feels insecure or lonely can be persistently (and annoyingly) loud. The sun conure is not known to be an extraordinary talker, but they can learn to say a few words. Conures, including sun conures, can be prone to feather picking. If a complete medical exam rules out medical causes of feather plucking, boredom and/or lack of appropriate mental stimulation can be a cause. Offer your sun conure an enriched environment with plenty of opportunities for play and foraging, as well as a staple supply of safe items to chew. Conures are also susceptible to Proventricular Dilatation Disease (PDD), Psittacine Beak and Feather Disease, Psittacosis, beak malocclusion and Aspergillosis. Regular health checkups by an avian veterinarian are crucial to your conure’s health, as they can help diagnose and treat many disease processes early on. Sun conures are often available in large pet stores, from avian-specialty stores and bird breeders. 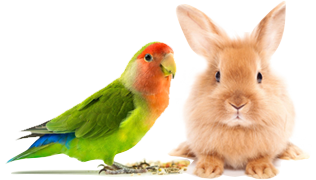 They are also often available for adoption from avian rescue/adoption organizations.